EPFL researchers have developed a method for accurately determining the toxicity of nanomaterials. 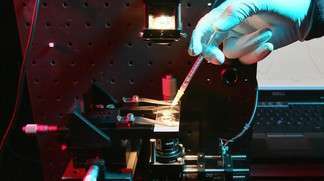 By using optical techniques, they are able to measure the concentration of the oxidizing substances produced by a damaged cell. Furthermore, this research also offers a new way to know more about the mechanisms of oxidative stress. Nanopowders, nanocrystals, nanofibers, nanocomposites ... Today we can find nanomaterials everywhere; in the products we consume and in our daily environments. In order to accurately determine their toxicity, EPFL researchers have developed an analytical tool for measuring the oxidative stress that some of them provoke on cells. They used optical techniques, such as measuring the light absorbed by certain proteins. This research is being published today in Nature's Scientific Reports. When a cell is exposed to a toxic product or a pathogen, this causes the internal equilibrium between the oxidants and antioxidants within the cell to break. Then the former, generally oxygen derivatives, are produced in excessive quantities and start to attack the cell's proteins, sugars and its membrane. This brings about a faster cellular aging, causes certain diseases to the cell, and may even lead to its death. Thus, the overproduction of such oxidants is a sign that the cell is stressed, and that is exactly what researchers wanted to measure. At the same time, they noticed that cytochrome c, a protein present in the cellular membrane, was a particularly interesting biosensor. They found that when it was exposed to certain wavelengths of light, this protein would absorb less light when in the presence of one of these oxidizing agents: hydrogen peroxide. Consequently, they developed a complex method for measuring the variations of light absorbed by cytochrome c. Finally, they tested and verified their method on small unicellular algae. To this day there were no truly reliable methods for measuring oxidative stress continuously and without damaging the cells. This new test has opened interesting possibilities for identifying not only the effect of nanomaterials, but also, on a wider perspective, the way cells react to an external perturbation. In addition, during their experiments researchers were able to observe that the toxicity of certain products could be conditioned and modulated by its surrounding environment. For example; a nanomaterial may be less dangerous under a laboratory microscope than within a river's waters. More information: "Sensing the dynamics of oxidative stress using enhanced absorption in protein-loaded random media", Guillaume Suarez, Christian Santschi, Vera I. Slaveykova, Olivier Martin. Scientific Reports.